Guyandotte River at Logan, W.Va. The 166-mile Guyandotte River is a tributary of the Ohio River that drains part of the Allegheny and Cumberland regions of southwestern West Virginia. The river forms in Raleigh County, southwest of Beckley, WV, at the junction of Winding Gulf Creek and Devils Fork. From the Raleigh County boundary, it flows westward across Wyoming County before turning north and descending slowly across Mingo County, Logan County, Lincoln County and Cabell County. It enters the Ohio River at Guyandotte, WV, near Huntington, WV. The river is impounded as R.D. Bailey Lake, centerpiece of the R.D. Bailey Lake Wildlife Management Area, near the midpoint in its course. The, Elk Creek Wildlife Management Area, Horse Creek Lake Wildlife Management Area, and Chief Logan State Park also protect land along the river and its tributaries. The Mud River, which joins the Guyandotte at Barboursville, WV, is its largest tributary. 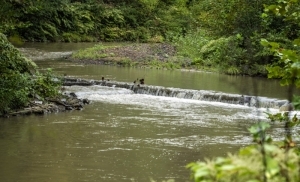 A splash dam crosses the upper Guyandotte River near its source at Amigo. Photo courtesy Tara Chavez. From source to mouth, the following select cities, towns, and villages are located on or near the Guyandotte River. Information on lodging, dining, and recreation on and near the lower Guyandotte, downstream of West Hamlin, may be found in our guide to travel in the Metro Valley Region, in western West Virginia. Information for the middle and upper river, upstream of West Hamlin, may be found in the Hatfields & McCoys Region, in southwestern West Virginia.